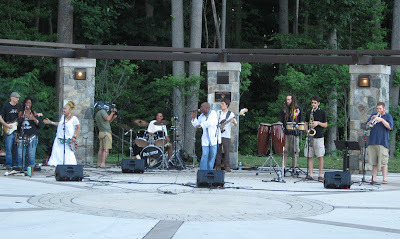 Eme & Heteru burned up the stage at Ossian Hall Park last night. Specializing in high-energy AfroRoots music, the group backs up leader and vocalist Eme with horns, guitar, percussion, and bass. The show was part of the Spotlight by Starlight series at Ossian Hall Park. Next Saturday, July 6, 7:30 p.m., is Indonesian Cultural Night with the Santi Budaya dance group. There are three Spotlight by Starlight concerts this week at Mason District Park: Ruthie & the Wranglers (country) on July 3, Sine Qua Non (jazz/soul) July 5, and David Peterson’s Old Time County Revue on July 7. All those shows are in the park’s amphitheatre at 7:30 p.m. For kids, the Blue Sky Puppet Theater performs July 6 at 10 a.m.